I began going to West Yellowstone, Montana as a six-year-old, snowmobiling with my family. Those annual trips continued for two decades, and are some of my fondest memories. The sense of independence, piloting my own snowmobile; wonderment at the winter scenery and wildlife; respect for the elements when breaking down and getting caught out in blizzards; cozy times with family and friends. Today, West Yellowstone is slowly wilting away. Regulations on snowmobiling in the Park have taken a toll, and what was once a healthy winter town is beginning to look like more of an "outpost" these days. It's a shame. Even at its late 1990's peak, winter visitation was a fraction of summer use (appx. 100,000 out of the 3 million annually), and it occurs on a protective layer of snow. 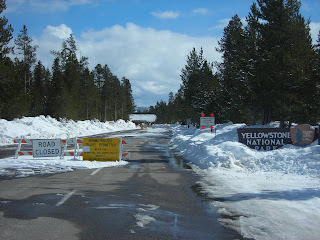 Yet for some reason, special interest groups decided that snowmobiling in Yellowstone must be curtailed or eliminated. Meanwhile, millions of diesel trucks, buses, autos, motorcycles, camping, fishing, swimming and etc. continue unregulated each summer. Someone explain the logic to me, please. But I digress. 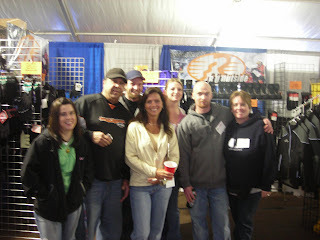 I now make the pilgrimage back to "West" on business every March, for the World Snowmobile Expo and SnoCross races. R.U. Outside is a sponsor of the event, plus we have a booth displaying and selling our winter boots, gloves, long johns, jackets, fleecewear and such. It's a great weekend, and the first public unveiling of the next season's new snowmobile models. Snow conditions at this year's event were terrific, the most white stuff I've seen in West Yellowstone in nearly ten years. 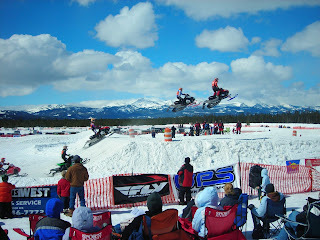 The SnoWest-built SnoCross race track was awesome, providing plenty of speed, jumps, turns and fun. It snowed off-and-on all weekend, but there were also windows of blue sky with pleasant temperatures. No complaints. I enjoy the excitement and bustle of tradeshows and events...to an extent. Then, I need solitude, time for introspection and reflection. I have gone to the West Yellowstone Expo for 17 consecutive years now, and every year I make a point to get outside and explore a little. 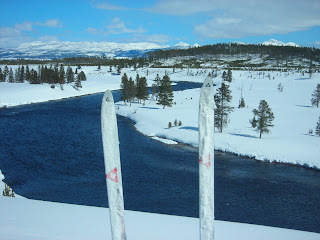 Some years that has been snowmobiling in the park, other years (when snow is low) riding my bike in the park, and other times (like this year) a nice ski tour outside of town. It's an incredible feeling to be standing there, alone, along the banks of the Madison River (world-class fly fishing) in our nation's first national park. Bison tracks are prevalent, wolves and grizzlies are roaming beyond any given horizon, and you can feel the presence of a vast, wild ecosystem. Priceless. 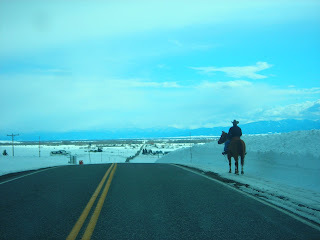 Driving home to Driggs, I passed an acquaintance out on his Sunday afternoon horse ride. The snow is still way too deep for any trail riding...so what the heck, just ride on the shoulder of the highway. It was a cool sight, and vintage Teton Valley, Idaho. 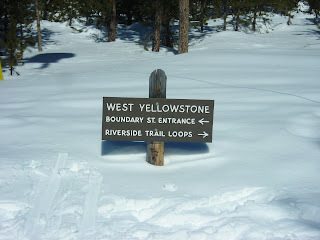 "Yet for some reason, special interest groups decided that snowmobiling in Yellowstone must be curtailed or eliminated." And now the snafu cycle continues with special interest groups who deny the science and the will of the majority in the hopes of making a quick buck. 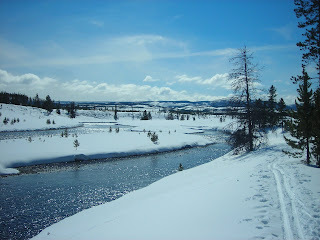 There are thousands of square miles surrounding yellowstone. Pleny of it snowmachinable. If snowmachining in the unprotected parts of the world just isn't as satisfying, maybe one can start by asking oneself why. I am Kurt's girlfriend and he told me to check out your website. We are hoping to visit you guys later this June, so let us know if you will be around! I can't wait to see Driggs. Looks like a place I've only dreamed about. Here is the real question: why don't we protect it in the summer, a season with 3 million visitors (compared to less than 100,000 winter visitors)? It's like bailing water while ignoring the tsunami. Have you personally been to the park in both seasons? Ultimately, it is good that people care. Meg: hello to you, as well! Look forward to seeing you, Kurt and Abby up here.